SKU: Model: RTU. Category: Automation. The Rotary Transfer Unit (RTU) represents industrial indexing, manufacturing and assembly processes. A number of programming exercises are possible from simple control operations to fault-tolerant processes. 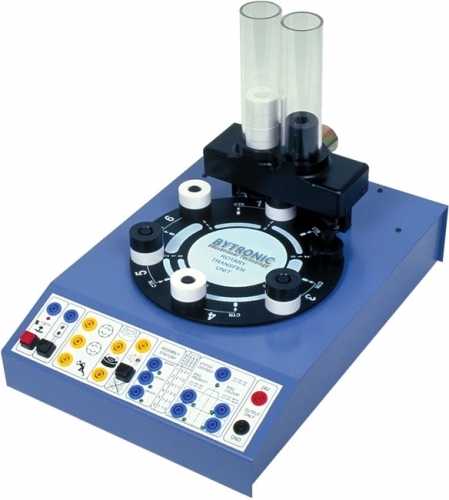 The RTU consists of a component dispensing mechanism positioned above a turntable. A turntable with metal pegs represents the assembly station that can be rotated in a clockwise or anti-clockwise direction with a two speed control. Using a control signal it is possible to dispense and assemble black and white rings from the clear plastic tubes onto the pegs in various combinations. Each station is identified using a binary code method with black and white sections on the underside of the turntable; this is also represented on the top of the turntable to help understand binary identification methods. Four infra-red reflective sensors identify the position and station number using a bi-colour identification system. The dispensing mechanism, using, infra-red sensors, identifies if the peg has a ring or rings loaded and the colour of the rings. The control panel includes an on /off and emergency stop push button and a button to silence the internal buzzer. Four switches are fitted on the rear of the unit for fault insertion. The unit can be controlled by a PLC, having ten digital inputs and six digital outputs, through the D type sub connectors on the rear, or the 4mm colour coded shrouded sockets on the front of the control panel. Connection can also be made to a PC, using a suitable interface card, or Microprocessor training board, through the IDC header with TTL connection. 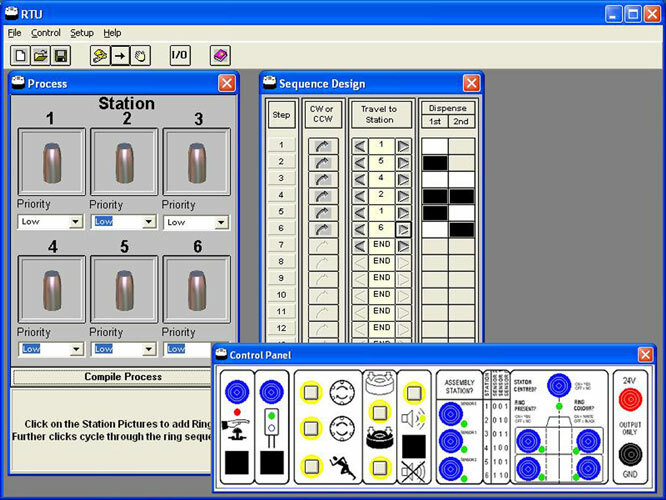 Control is implemented using high or low level programming languages.